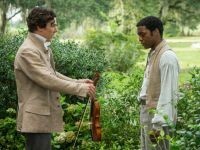 Benedict Cumberbatch is long gone from New Orleans, as is the rest of the "12 Years a Slave" cast, which opened 1st November in the States and opens in the UK on 28th January. But, as it turns out, the suddenly-everywhere actor and British heartthrob is never too far from the Crescent City – figuratively speaking, anyway! "I have the radio station WWOZ on my phone," Cumberbatch recently told Time magazine, referring to the mobile app for the local radio station that celebrates and perpetuates the city's cultural heritage. You can listen on your computer or download the app if you also want to hear WWOZ New Orleans radio. Cumberbatch's comments, and the peek into his listening habits, came as part of a wide-ranging feature about the spate of noteworthy roles he's undertaken since the BBC1 series "Sherlock" catapulted him to trans-Atlantic fame. In addition to "12 Years a Slave," this year alone sees him playing parts in such varied films as "The Hobbit: The Desolation of Smaug," "Star Trek Into Darkness," "August: Osage County" and the Wikileaks film "The Fifth Estate." All that screen time has cost Cumberbatch much of his anonymity. He figured he'd be able to fly beneath the radar in Oklahoma while shooting "August: Osage County." He was wrong. But in New Orleans, where many locals take pride in giving visiting stars their distance, he said he was able to find a measure of anonymity as well as inspiration. 12 Years a Slave is a British/American epic historical drama film, based on the 1853 autobiography Twelves Years a Slave by Solomon Northup, a free black man who was kidnapped in Washington DC and sold into slavery in 1841. He worked on a plantation in Louisiana for 12 years before his release. The film is directed by British film director Steve McQueen with British actors Chiwetel Ejiofor as Solomon Northup and Benedict Cumberbatch as plantation owner William Ford. Brad Pitt also produced and stars as a carpenter who expresses his opposition to slavery. You can read more about Civil Rights in Deep South USA and places of interest.